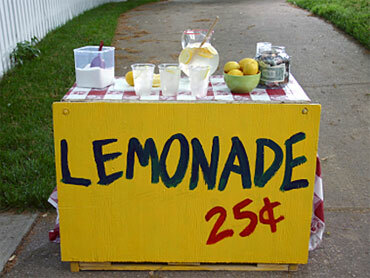 (CBS/AP) WARNER ROBINS, Ga. - Donations poured in to a Georgia family after word spread that a lemonade stand to raise money for a hospitalized toddler had been robbed. Three girls were robbed of about $150 Saturday at their stand in central Georgia, authorities said. They were trying to raise money for a cousin of one of the girls, a 2-year-old who is to undergo treatment for an intestinal disease. The sick child's mother, April Varnadoe, says the family received more than $3,000 within 12 hours of the story airing on local television. A 13-year-old girl was holding the jar containing the money when the man snatched it from her, Houston County sheriff's Lt. Jon Holland said. Holland said. Authorities arrested 21-year-old Amber M. Umbarger and 20-year-old Gage Allen Turner. Jail records state that both suspects are charged with robbery by sudden snatching. WMAZ-TV reports the family of one of the robbed girls planned to leave Wednesday for Ohio, where her 2-year-old cousin is to undergo surgery at Cincinnati Children's Hospital Medical Center.